How Does the Lyme Borrelia Spirochete Survive and Thrive? “The spirochete that causes Lyme disease has three times more useful genes than Syphilis, and uses its evolutionary advantage to evade detection and survive destruction by both the immune system and antibiotics. It is both stealthy and insidious.” -Tom Grier. Detailed information is available if you are interested in learning specifics and scientific explanations. The paragraphs that follow are an attempt to explain in simple terms the basic functions of how this infection works and why standard treatments fail. Although Lyme disease can be transferred in many ways, ticks are a prime host for transfer to humans due to the amount of time they feed (typically for 1-3 days although infection can occur immediately). Tick feeding practices are also designed to counteract host immune responses. This gives the Lyme bacterium time to familiarize itself with the host’s DNA and immune system; allowing it to travel within the bloodstream undetected. 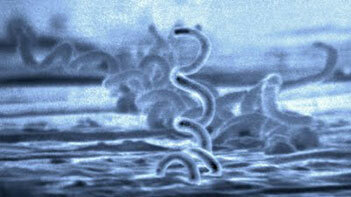 The Lyme spirochete (Borrelia species) is a uniquely opportunistic bacterium with an unusual ability to self-preserve. It acts more like an exceptionally intelligent protozoan parasite than a common bacterium. It is highly motile, and can penetrate blood vessels easily. It uses the bloodstream to quickly find opportune sites to hide from immune responses and prefers to colonize in collagenous tissue such as the brain and central nervous system, joints, organs, etc…. Once initial infection occurs, the spirochete takes the opportunity to activate genes that will ensure its ability to survive and thrive within the new host. One way in which it does this is by altering the expression of surface proteins further confusing the host immune system. These surface proteins are what kick-starts the immune system into creating antibodies. Essentially, the host immune system can’t keep up. Once isolated within the brain it can divide and change many times into an undetectable strain that the peripheral immune system will simply ignore. The result is an infection that can quietly inhabit the brain and other tissues for years or decades. This is why blood tests are unreliable. If our immune system cannot detect the infection to create antibodies, or if the infection is in a non-active state, there is no way of finding a positive result in a blood sample. Therefore, it is especially difficult to find a positive test result in someone who is in late stage Lyme infection. Clinical diagnosis remains the most important way of determining if someone is infected with the Lyme spirochete. It is crucial once diagnosed with Lyme disease and treatment has begun, that treatment is not stopped prematurely. Relapses can be much more dangerous and difficult to eradicate than the initial treatment. The division time and life cycle of Borrelia spirochetes is longer than typical bacteria, which is why standard treatments fail. The Lyme bacterium can become metabolically inactive for long periods of time making antibiotics ineffective as they can only kill bacteria when they divide. No antibiotic can kill a bacterium that is metabolically inactive and spirochetes are well known to have mastered this form of survival. Many naturally occurring simple bacteria, such as the bacteria that cause acne, successfully survive antibiotic treatment. Simultaneously killing all the surviving bacteria in late infection with short courses of antibiotics is impossible and may not even be possible with extended courses of antibiotics. In its basic form, the Lyme Spirochete is spiral shaped and can literally bore deep into tissues, hide, and colonize. When it senses “danger”, such as an immune response or antibiotics, it has the ability to change its structural identity into two different forms to ensure survival. The L-form occurs when it discards its cell wall and integrated surface proteins. This form often evades the immune system and many antibiotic treatments, and is capable of intracellular infection. In some cases, it can trigger an auto-immune response which then attacks our own tissues. The cystic form creates new challenges for the immune system which can be ineffective against all various defense mechanisms of this bacterium. It mimics good cells in the host body so it can remain invisible, similar to putting on a costume. This form is resistant to antibiotics, does not present antigens to the immune system, and can shift into a reproductive state while encysted. Quite simply, the Lyme spirochete is a survivor at all costs. Once conditions improve, the Lyme bacterium can change back into the spirochete form and “re-infect” the host. It can change forms within 1 minute of expression and survive up to 10 months before reconversion. The preferred form of the Lyme spirochete is dependent on its physical surroundings and environmental cues. It can also survive both freezing and thawing and successfully infect the host 12 months of the year. This unique ability to shift forms and hide from our natural immune responses and antibiotics makes it difficult, if not impossible, for some to achieve full recovery. This is why relapse rates are so high in Lyme patients. It also explains why some people do not show symptoms right away, and may not show symptoms for weeks, months, or years after the initial infection. The Lyme spirochete is a highly evolved pathogen with many mechanisms of evasion and survival. Believing this disease can be easily eradicated and cured is arrogant, unfounded, and dangerous. Special thanks to Tom Grier for his endless support, advice, and help in understanding this disease. You truly are an inspiration. The first step in healing is understanding what you are faced with.